With Mission Impossible: Fallout about to hit screens, this franchise will join the ranks of 6-part series such as Tremors, Universal Soldier, Leprechaun, and Resident Evil. Let’s hope unlike those mentioned, Tom Cruise and company can continue their streak of excellent action films with exciting set pieces. Speaking of which I thought I’d look back at the five previous entries and pick my favorite moments of Ethan Hunt taking on the world. 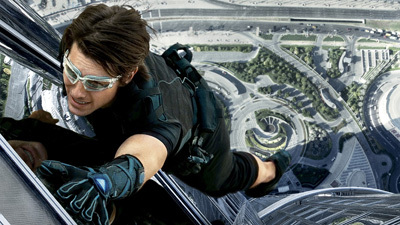 Mission: Impossible– Staring things off with this first in the series that was helmed by the great Brian De Palma and featured a very different kind of movie than what came after, but still trilling in its own way. My favorite moment is after Ethan (Cruise) has suffered a group tragedy and is meeting with the head of his IMF (Impossible Mission Force) division at a restaurant with aquariums for walls. 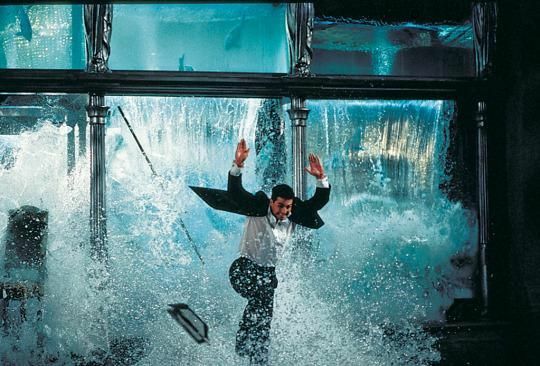 When his confrontation with Kittridge (Henry Czerny) takes a turn, Ethan needs a fast exit and utilizes his explosive gum to shatter the walls flooding the room with water as Ethan does a non-CG slow-mo run out of the building as the gallons and fish follow close behind. Mission: Impossible II– In this John Woo at his most 90’s action peak, we find Ethan on vacation winding down the only way he knows how, by rock climbing without a rope and harness. Not that the movie peaks at this opening, because we still get the signature Woo of jumping through the air while shooting, a gravity-defying motorcycle chase, and of course, pigeons. This is just where it began with Cruise putting his safety at risk for a great visual. This would become the staple of the series for every film that followed. Mission: Impossible III- This is where the series hit its stride and set up Ethan’s character and tone for the next few missions. With J.J. Abrams behind the camera fresh off his run on Alias he gives MI:III the most actioned pack of the series with set piece after set piece outdoing the previous and while the interrogation of Owen Davian (Philip Seymour Hoffman) by Ethan is fantastic, the scene I love is the bridge sequence. It has everything, a daring escape, Ethan and his team protecting people, explosions, and jets roaring over-head. It was one of those rare moments when it worked as it was shown in the trailer as well as it did in the film. Mission: Impossible-Ghost Protocol- Now without a doubt this mission has the best sequence in the entire series, as animator Brad Bird in his live-action directorial debut was responsible for dangling Tom Cruise over a thousand feet in the air outside the Burj Dubi without a stunt double. This scene is amazing, not just as a stunt but also done with incredible humor as it incorporates a great concept not previously seen as much in the series where all the cool super spy gadgets don’t work and the focus is not on Ethan as a lone wolf, but on the team working together. Mission: Impossible-Rouge Nation- While this film has many great set-pieces, including the opening of Cruise once again without a stunt double hanging on to the side of an Atlas C1, a awesome motorcycle chase, and the intense under-water sequence. Nothing compares to the sheer perfection of the Vienna State Opera house scene. An assassination attempt foiled that leads to amazing hand-to-hand fight, and what has become common place; a clever Ethan Hunt exit, with a touch of humor thrown in. Director Christopher McQuarrie who will be the first director returning to the series with Fallout brings that edginess that carried over from his work with Cruise on the near perfect Jack Reacher. Now that it is clear what Mission: Impossible the film series is, I imagine Tom Cruise will be making these until he is physically unable to do so, even then, he still might. Until then. Bring on the next mission!